✔【 Ultra-HD 4K Video Camera 】 With 13.0 Mega pixels COMS sensor, 48.0 MP Video resolution, 16X digital zoom and IR night vision function, you can enjoy image and video with high quality, and share your life with your family and friends in real-time and FHD quality camera. 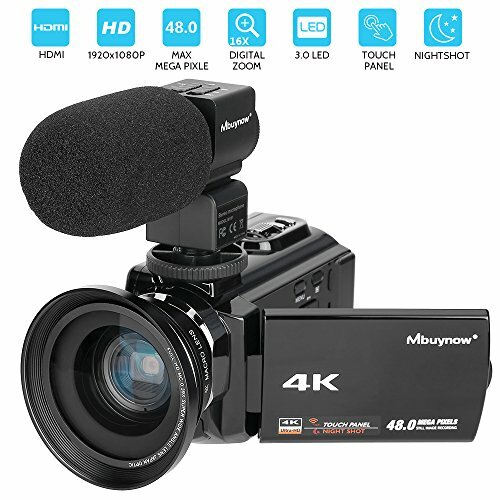 ✔【 External Microphone & Wide Angle Lens 】 With 2 in 1 HD 72mm professional 0.39x super wide angle lens and professional high-performance microphone, this 4k digital camcorder with microphone is very useful in media interview, speech, symposium, conference and film. Noise canceling effectively and enhance sound quality. ✔【 Support WiFi and IR Night Vision Functions 】 Built-in Wifi, please download \" NovaCam\" APP first and open it to control camcorder: playback, record, photo, download files. Under the infrared night vision，you can press the IR button so that you can take photos and videos during dark night. ✔【 Powerful Battery 】 Equipped with NP-FV5 Plus 3.7V 2500mAh rechargeable Li-Ion batteries, you can use 4K camera camcorder to take videos 2 hours, and pictures up to 2.5 hours. ✔【 HDMI Output 】 The HDMI cable can be used with a variety of everyday electronic components, including computers and home-theater screens. It can provide video, especially at high resolutions, and renders small, high-contrast details in high quality.